One of the benefits of Cocoa applications is its compatibility with one of my favorite utilities, Afloat. Afloat offers several benefits to Cocoa applications, such as the ability to adjust the transparency of a window and keep the window “Always on Top”. Other features include a “Keep Afloat” action, which actually dims the window until the mouse is hovering above the window. Afloat can be triggered via the Window menu or with simple, easy-to-learn key commands. Another benefit to Afloat is that it is served as a System Preferences pane, rather than a background or menu bar application. Afloat requires the SIMBL framework, which can be installed via the Afloat preference pane once installed. Afloat is a Universal Binary and is compatible with Mac OS X 10.3.9 and higher (including Tiger). Pre-Release v3 of Afloat 1.0 is available as a free download. Make your windows float above all others, make them transparent at the scroll of your wheel or in a single keystroke, and move them without having to go search for the title bar. 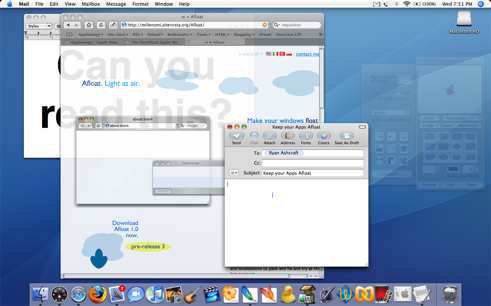 All of this, for most Mac applications, in just a few clicks.